Axwell & Ingrosso, fresh from their set at Ultra Music Festival main stage and closing out Coachella's Outdoor Theatre to one of the largest crowds of both weekends, are all set for the summer ahead. Their summer track ‘Sun Is Shining’ has been synced to the global Summer Starts Now campaign for Swedish fashion house H&M. The campaign’s lead commercial was shot in Antigua and stars supermodels Natasha Poly, Doutzen Kroes, Adriana Lima and Joan Smalls. 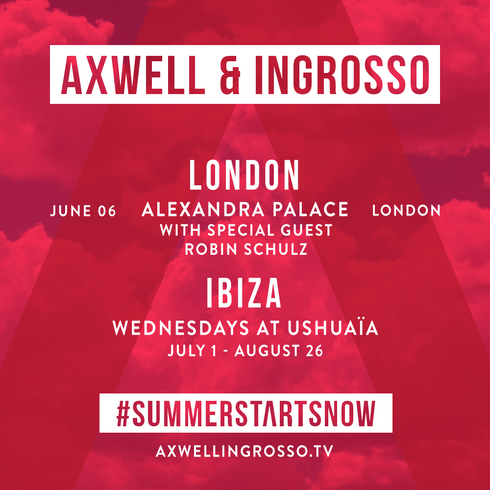 To confirm their hold over the season after Fader named their track On My Way’ as a contender for Song of The Summer, the duo have announced their London return at Alexandra Palace on 6 June with special guest Robin Schultz, and confirmed their return to Ushuaïa Beach Club in Ibiza on Wednesdays from 1 July 1 to 26 Aug. Guests for the summer will be announced shortly. With a host of festival performances from Outside Lands in San Fransisco to Summerburst in Sweden, the summer has started.